Thinking of hosting a Flower Crown Class for your upcoming event? 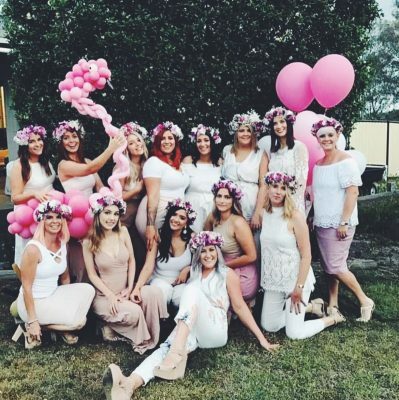 Whether you are throwing a Hens Party, Team Bonding, Baby Shower, Bridal Shower or just an afternoon surrounded florals and your favourites, we arrive at your chosen location with beautiful seasonal florals & foliages. As well as all of the tools and materials you and your guests need to create your very own Flower Crowns. We travel all over for our classes from Brisbane to the Gold Coast, Byron Bay, Sunshine Coast and Toowoomba. Simply send us through a little information about your event (date, location, number of guests) and we will send through our Flower Crown Party Pack. Need a flower crown for an upcoming event? If you are heading off to the races or wanting to take your outfit to the next level why not organise a custom flower crown for pickup or deliver. Simply provide some details (date, size, budget, colours) and we will be in touch!